We've got several months worth of experience with the Shoei Neotec modular helmet under our belt now so the plan is to tell you what our experience has been so far and add some periodic updates. The Shoei Neotec - modular is a well crafted helmet. It exudes quality in EVERY detail. Ours is solid white and the colour is beautiful and shiny, the Shoei logo's are prominent on the front. If you couldn't tell from the shape of the helmet alone, you'll know, and so will everybody else - that you're wearing a Shoei helmet. Note the curve at the rear top of the helmet - that's a shell integrated spoiler to reduce lift and drag at speed. Pretty cool! - The flip up mechanism works wonderfully and once you put it on you'd never know you weren't wearing a solid full face helmet. Except when it comes time to put your glasses on, pump gas, talk to somebody, get some fresh air at a long stop light, etc. You've now got the luxury of flipping up the front of the helmet and voila - everything is suddenly a little easier! - VENTILATION: This helmet vents better than any helmet I've ever worn. You can feel the air flowing through this helmet even at low speeds. The vents are very simple to operate - there's a chin intake and another just front top of the helmet which you just slide back to open and forward to close and a third vent, which is an exhaust vent towards the back. They're VERY simple to operate with gloves on which is nice. It's very easy to become familiar with their location and operation which makes using and adjusting them quick and safe while riding. On cold days the ventilation might be a little too good. You can actually feel a bit of air leaking into the helmet via the vent and it seems to hit you just above the centre of your eyebrows where the inner liner touches your forehead. Apparently Shoei is aware of this and that some people have expressed some dissatisfaction with it. They indicate the helmet is designed to flow a little bit of air through the intake even when closed to keep things fog free. You can get special piece, which according to Shoei fixes the issue, if it bothers you. This season so far has been a good test of cool weather riding with this helmet. It's typically been in the 2-6 degree celsius range for my rides to work in the morning and I can definitely feel the air leaking in a bit at the top/front of my head. It's not so bad but I may see about getting that fix just to see how it works and if it makes the ride more comfortable. The area under my chin gets the most cold air on the ride in to work and that's not really a helmet issue - I'd need a balaclava or neck warmer to cut the draft coming over the top of my jacket and under the helmet. FACESHIELD/OPENING: The shield is great quality and vision through it is fine. No complaints there. The opening allows for excellent peripheral vision and I haven't had any issues seeing while tucked down. Upwards and downwards vision is excellent. 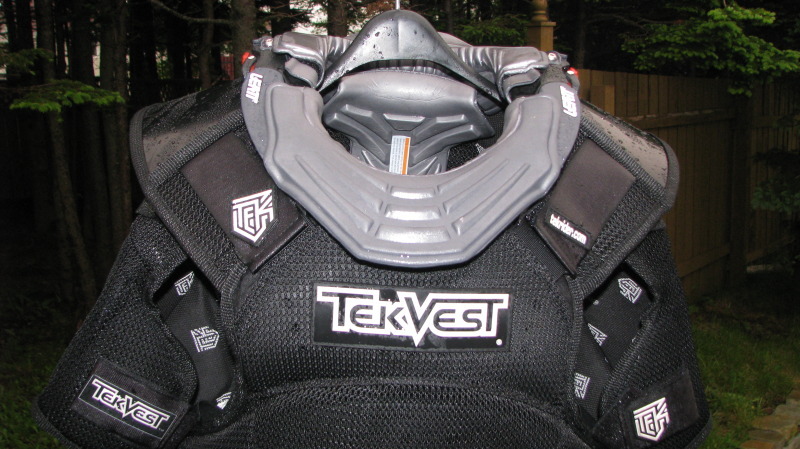 The shield has lots on indentations so you can open your helmet just a crack if needed and seals very solidly against gaskets. There's one spot on the visor to flip it up and it's on the left side of your head so when you're riding and want to adjust it I tend to use my throttle hand so as to avoid any jerky one handed throttle inputs while doing that adjustment. This means that you're crossing your hand over the opposite side of your head to open the visor. It becomes second nature after a bit but some helmets have the tab on both sides. Aerodynamically I suppose having it on just one should minimize noise. FOGGING: The shield seals really firmly and in cool weather (used without the included pinlock system) I've had some fogging issues. Whenever I'm stopped I get fog and have to crack the shield open to clear it. It clears very quickly but it's more than a little fog - it's a lot. I've been cleaning the shield with Plexus but probably not enough admittedly. I'll have to find a product small enough to fit in my tail bag so I won't have any excuses. I really need to get that Pinlock shield in place as that may rectify the fogging I've been experiencing. (I'll update the article once I'd tried it out). UPDATE: Tested out the pinlock system - SUCCESS! The pinlock system works wonderfully. No fogging at all. I do wonder why the pinlock system is so necessary with this helmet though. Even just putting the helmet on inside it'll fog up without the pinlock. INNER VISOR: The inner visor has no indents - it operates smoothly through its entire range via a lever on the left side of the helmet. If you've ever had a dark inner visor on a helmet I'm sure you enjoy this feature. Honestly, I didn't use it much on previous helmets I've owned but this one is fantastic. The optical clarity is superb and I find it actually improves my vision on sunny days. I use the inner sun visor a lot on this helmet. Its fantastic when you're riding into the sun. As opposed to wearing a tinted visor this one is there when you need it and gone when you don't. The optics quality is excellent and it has sufficient range so the bottom edge doesn't provide a visual distraction. Multitec’s modular design was used as a backbone, analyzed with scrupulous eyes, and tweaked ever so slightly to yield the most progressive flip-up helmet on the market today—the all-new Neotec. Boasting improved shell aerodynamics, a wider and taller field of vision, a reduction in wind noise, an internal sun shield, and a fully removable, washable and replaceable liner system, the Neotec is the next level of modular helmet design for today’s hybrid motorcyclists. 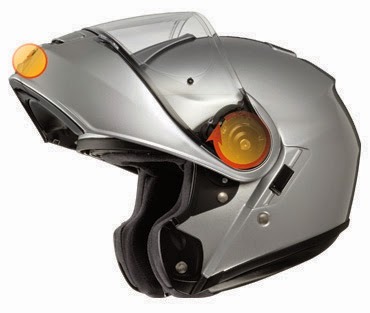 The Neotec’s flip up design offers the convenience and versatility of a full-face helmet that converts instantly into an open-face configuration. Utilizing an enlarged lock release button to facilitate easy handling with gloves on, the Neotec’s lightweight chin bar and face shield rotate with smooth precision on a single axis point, yielding the seamless versatility of a true two-in-one design. For more information and details specs for the Shoei Neotec be sure to visit their website HERE. Canadian MSRP pricing is $759.99 -$779.99 but you can pick one up online in the $683.99 - CA$701.99 range for a solid colour. UPDATE (Jan 20th/08): Motorcyclist magazine has recently (Jan or Feb/08 issue) published another article on helmet safety and indicate Snell has a new standard coming out that accounts for the size of the head of the person wearing it. They believe that their article had a lot to do with Snell coming out with the Snell M 2010 standard. Motorcyclist goes further to say that many helmets that pass the current Snell M 2005 standard won't pass the M 2010 because they're too still. Manufacturers can still make helmets to the M 2005 standard until March 31, 2012 and Snell 2010 helmets won't be available until October 1, 2009. Most people realize the importance of a wearing a helmet on a bike and if they don’t, for the most part it’s legislated here in Canada that they wear one anyway! There are cases in some provinces that will permit you to not have to wear a helmet. For example in Manitoba you don’t have to wear one if you’re in a legally authorized parade, if you’re a bona fide member of the Sikh religion, or you’ve got a medical condition that would prevent you from doing so and have a signed certificate from a qualified medical practitioner. For the rest of us, that brings about the inevitable question. What helmet should I buy? That’s a decision you’ll have to make for yourself in the end because there isn’t a simple answer. Hopefully ou’ll be able to make a more informed decision after this article though. What you should know before you make that decision is that a helmet must conform to standards; which standards the helmet must meet can vary by province but in general, two standards that typically appear on helmets produced for the Canadian market; Snell and DOT. In some provinces you can also use helmets that meet the Canadian Standards Association Standard D230, the American Standard Institute label, or the British Standards Institute respecting motorcycle helmets. I’d say the majority of riders in Canada have either a DOT approved helmet, or a Snell approved helmet. Snell helmets meet or exceed DOT requirements. Since these two standards are the most common here in Canada we’ll focus on those two. There are some differences between the two standards that motorcyclists should be aware of when purchasing a helmet. DOT has been around since 1974 and was based on standards developed before that time. The Snell Memorial Foundation (SMF) was formed in 1957 after William “Pete” Snell died from massive head trauma sustained in an auto race. The SMF is a non-profit organization that developed a standard for testing motorcycle helmets that they continually test and update every five years. The testing standards are different and the verification required of the results are different as well. DOT standards are not as stringent as Snell’s and Snell tests for a greater variety of impact types and severity. In order for a company to claim to meet Snell requirements the manufacturer must submit several helmets to Snell for testing. If the helmet passes the test they enter into a contract with SMF which allows SMF to buy and test the helmets on an ongoing basis to ensure they continue to meet the requirements. DOT allows manufacturers to perform their own tests to determine if their helmets are DOT approved. The government may on occasion run some tests to check on manufacturer claims. How does a helmet protect? Helmets are composed of two parts: the outer shell and an energy absorbing inner liner. The inner liner is made from expanded polystyrene (EPS) and the outer shells are made from resin/fiber composites or molded thermoplastics. The shell does a few things; it protects against sharp objects from puncturing the helmet and skewering your head and protects against abrasion. The EPS does a lot of work too though; it’s the liners job to slow your head down over a great as distance as possible when you hit something solid with your noggin. The goal is to reduce the G-loads on your brain in a crash. Snell helmets are a bit firmer because they must meet higher energy impacts to meet the Snell standard. A tough part of the test is a two strike test on the same spot of the helmet that isn’t allowed to transmit more than 300G’s to the head form in either hit. This might sound like what you want but some argue that the harder helmets are unnecessarily hard and transmit more G-forces to your head rather than using up the EPS liner. Motorcyclist magazine came out with a very controversial article a few years back that analyzed several helmets and compared the DOT helmets to the Snell helmets. I won’t get into the findings of the article because it is lengthy and very detailed. The article does say that helmet safety has come a long way and helmets you buy today are very good at their intended purpose. More expensive doesn’t necessarily mean better though. In addition to the standards a helmet meets there’s also the “fit” of a helmet that is very important. Helmets come in different shapes and sizes so what’s comfortable to one person can feel very uncomfortable to another. It’s essential to try on a helmet and keep it on for a while to truly test it. A helmet can feel great when you initially put it on but after ten minutes it may feel like a torture device. Also consider the color; conspicuity is critical on a bike and many say that white or yellow helmets are among the most visible. Another very important test when getting a new helmet is a roll off test: fasten the helmet up snugly, grab the rear of the helmet, and try to lift up and forward to roll it off your head. To protect you a helmet has to stay on your head. If you can roll it off – it doesn’t fit properly. So be careful to get a helmet that fits and you may also want to read up about safety standards. - Link to the Motorcyclist Magazine article that created a firestorm of controversy when it was first published. It’s a long one! It’s got some really interesting information in it though you may want to skim through it at least. - Link to the Snell Memorial Foundation (SMF) website. This website has a lot of helpful information on helmet safety and in particular the Helmet FAQ section has some interesting reading.